It's so easy in life to drift, to slowly allow things to effect us in ways that eventually change us, whether we're aware of it or not. For me, I've battled over the past few years with drifting into negative thinking. I don't know exactly how it happened or when it began. I think there's been a thread of it within me all my life, but recently I've noticed that it's become more dominant. I think in part it's a dark side to my nature. I'm a visionary thinker. I see pictures of how things in life should be. I get pretty passionate about affecting change, especially in my job in the church. Reality often is far from the vision of how things should be and it's often very hard being instruments for change. These battles tend to make me weary, and when I am weary I'm not as good at balancing my attitudes. I've been weary for a number of years and this is where I believe the drift toward a negative outlook has crept in. I have not enjoyed noticing this drift. I've always had a fairly positive outlook, even through many years in my life of facing difficult life situations and trials. It has been a tough battle for me over the past few years to try to figure out how to change this attitude/perspective drift. It has been a constant part of my prayer life and I've spent a lot of time looking at this with my pastor/mentor over the past few years. Some of the practices I've made a part of my life have come about as ways to try to keep the weariness at bay, as I have become aware of how much the weariness/burn-out tendencies feed this negative outlook. Practices such as art journaling, making "white space" in my week, self-discovery, balancing my schedule, and doing things that re-energize me on a regular basis help keep me from drifting into weariness. 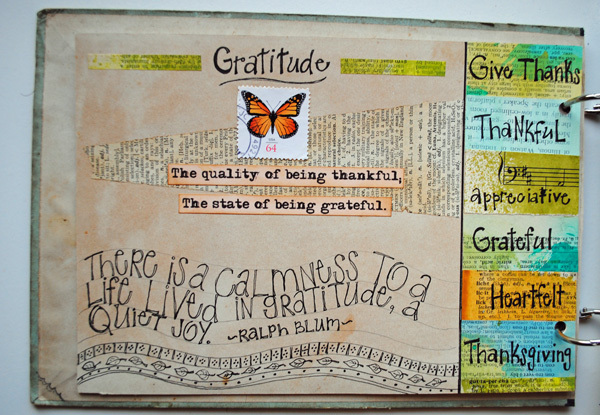 And this study led me to looking at making gratitude a practice. 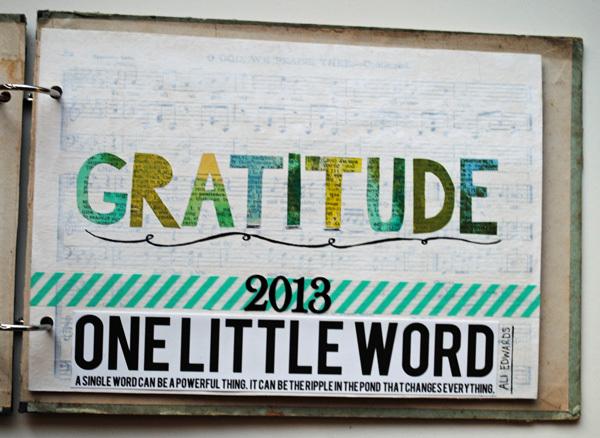 This practice of gratitude and its effects on changing my perspective is what I intend to explore throughout the year. 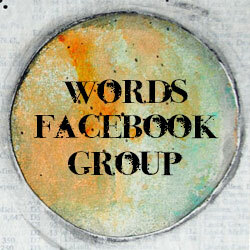 As a way of keeping me focused and on track through the year, I have joined Ali Edward's group/class "One Little Word". It is more scrapbook based, which I'm not into, so I have made a journal to art journal my journey with this word. 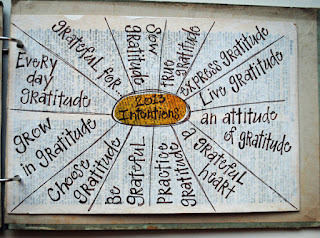 Ali's first challenge for the month of January was to create a list of 12 intentions that fit our word to use as guidelines through the year. It was a good practice for focusing in on areas to concentrate on for the year...to be intentional in creating a journey for growth. 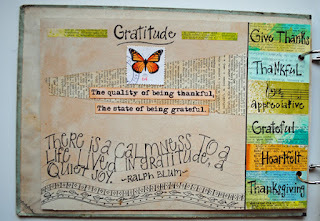 The start of my Gratitude Journal ~ an altered book, of course! "A single word can be a powerful thing. It can be the ripple in the pond that changes everything." My intentions for making gratitude a way of life. The first few weeks of this month/year have started out very busy ~ hosted a baby shower, finishing and presenting the church budget, some draining issues to work through with some people ~ I'm ready to get back on track. Ready to re-connect with the very practices I spoke of above! Wonderful word for the weary soul! 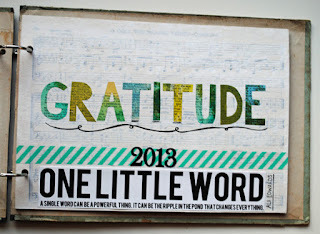 Also, Ann Voscamp's book 1000 Gifts, has been helpful to me in developing a grateful heart. Looking forward to hearing more about your journey with your word! Appreciate the comments, Mary! I'm familiar with both authors through their blogs, but have not read either book. 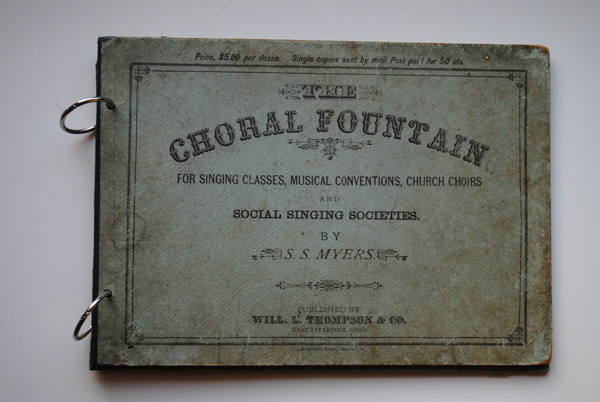 I'll have to add them to my reading list! Enjoyed your interview and art in the new Somerset Studio!